I have talked about my love of pancakes before, but I have never truly talked about my love of frosting and pancake toppings. I’m very pro-maple syrup and it’s definitely something I try to find when I go to the farmer’s market (go local! ), but with prep, I try to stay away from excess sugar that comes along with syrup. I also can’t handle fake syrups that are made with sugar substitutes. An alternative that I use frequently is a protein glaze, or protein “frosting”. It’s easy to make, tastes great and helps kick that sweet tooth. In a bowl add 1/4 cup plain non-fat Greek yogurt and 2-4 tablespoons of water. The water helps thin out the yogurt so that your protein powder can mix easily. Add 1 scoop of protein and mix until there are no lumps. I use Cellucor whey protein in cinnamon swirl often because it has a cream cheese frosting taste. Pour on top of pancakes. The best thing about this recipe is that you can use the whole portion in one sitting. I usually have some left over after putting it on my pancakes and eat it stand alone. 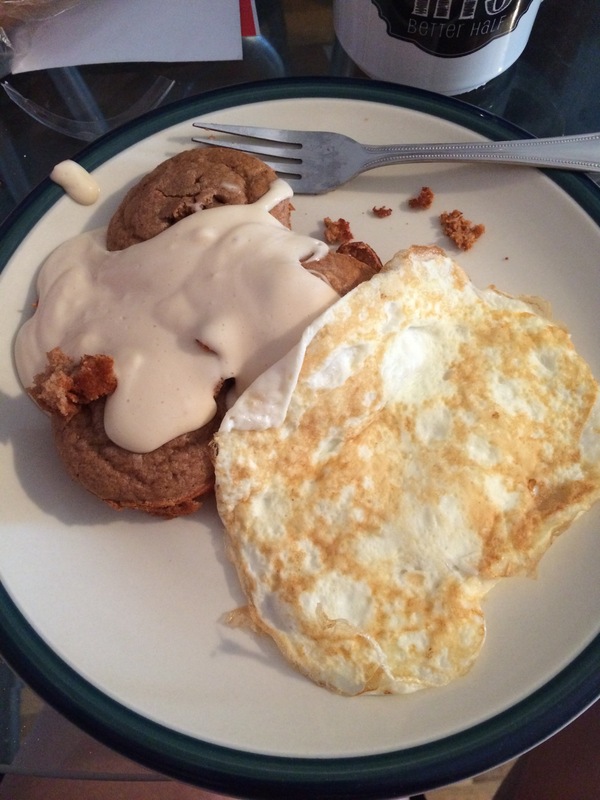 In the picture above I have 2 egg whites with my protein pancakes by FlapJacked and my protein “frosting”. Breakfast is the most important meal of the day and for good reason. A well rounded breakfast can energize you and set you up for success for the rest of the day. I know this is something I enjoy most Mondays. Can #pancakemonday be a thing?! Pssh it is now! I hope everyone has a great night! Don’t forget to start the week off right!